If you like to grow your own vegetables, late fall presents one last chance to get a crop in the ground. 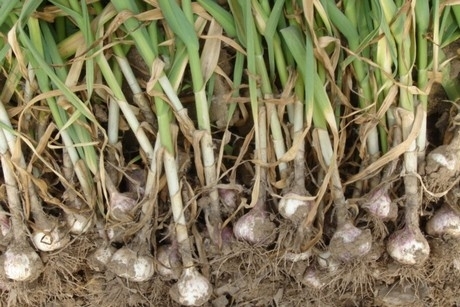 Although it is too late for most cool-season plants, it’s the perfect time to plant garlic. You can plant garlic anytime between October 15 and February 15, but the earlier you plant, the better. The bulbs will have longer to grow and will be larger. Consider how much garlic you use in a month, then estimate how much you would like to grow. Garlic doesn’t take up much space in the garden and, when properly stored, keeps for months. So it is possible to grow an entire year’s supply. There are two types of garlic. Softneck garlic is well-adapted to our mild winters, stores well, and is the type of garlic used for garlic braids. Hardneck garlic, also called “rocambole,” forms flower stems in the spring. Both types are interchangeable for cooking, although varieties differ in flavor, ease of peeling, and perishability. It’s best to get garlic from a nursery that sells certified, disease-free bulbs. Garlic from the grocery store may have been treated to retard sprouting. Nurseries have the best selection beginning in August; by now, your choices will be more limited as the nurseries begin to sell out. Prepare your garlic bed with two to four inches of well-aged compost or manure. Add a balanced fertilizer that contains phosphorus and potassium. Some of the organic granular fertilizers available in garden shops would do well. A day before planting, soak the bed so that it is thoroughly moist at least six inches deep. You won’t water again until the sprouts emerge. Separate the heads of your seed garlic into individual cloves, setting aside the smaller cloves. Do not peel them. Plant the larger cloves blunt end down, about an inch below the soil surface and four to six inches apart in all directions. Each of these cloves will provide a head of mature garlic next year. Once shoots emerge, water regularly until winter rains start. If we have a dry winter, as we did last year, you will need to continue watering if you want to harvest large bulbs. Do not keep the bed soggy, however. Panting garlic in a raised bed will help prevent the plants from rotting if we have a wet winter. When plants begin growing rapidly in late winter and early spring, add a nitrogen-rich fertilizer. An easy way to fertilize is with a liquid preparation such as worm compost tea or fish emulsion. Between May and late June, the tips of the garlic leaves will start to yellow. That’s your sign to stop watering. The softneck varieties will fall over. The garlic is ready to harvest when the leaves are more than half brown. Allow the ground to dry thoroughly before harvesting. It is better to dig up the plants rather than pull them. Cure the whole plants for a couple of weeks in a warm, dry place away from direct sunlight. Then you can discard the leaves and store the roots in a cool, dry, airy place. If gophers are a problem in your garden, be forewarned: they like garlic as much as everything else. If your beds are not lined with gopher-proof wire, you can plant garlic in wire baskets set into the ground or grow your garlic in pots. Excluding these pests is the most effective way of protecting your garlic crop. Aphids can also be a problem, especially if you are growing onions, nasturtiums or artichokes nearby. Inspect plants regularly, and if you find aphids, spray them off daily with water or use an insecticidal soap spray twice a week. If your garlic rots before it matures, you might be overwatering. Some fungal diseases also affect garlic, although I have not seen them in my east Napa garden. Dig out diseased bulbs and consider bringing them in for assessment to the Master Gardener Help Desk. You have a long wait until next summer’s garlic harvest, but you can still enjoy home-grown garlic in the interim. Remember those small cloves that you set aside? Plant them close together in a separate area of the garden to harvest as green garlic throughout the winter. You can harvest the shoots anytime and use them like a mild, garlicky green onion. The leaves are high in vitamins A and C, and they will add a fresh, mild garlic taste to your meals all winter long. Workshop: Napa County Master Gardeners will hold a workshop called “Design Your Own Edible Landscape” on Saturday, October 19, from 10 a.m. to noon, at Napa City-County Library, 580 Coombs Street, Napa. Learn how to integrate edible plants into your ornamental garden. Bring a detailed plan of your garden to work on with guidance from Master Gardeners. This is a free workshop but registration is required. Register here. Pat - I'm a MG in the Tahoe Basin and leading up some growing trials of garlic (and onions) for a fall planting. I'm contacting you requesting permission to use (citation provided) some of the information/images in this blog.